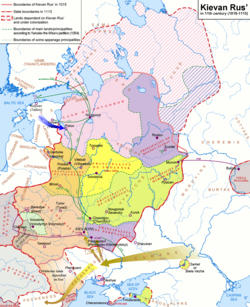 Kievan Rus' (also Kyivan Rus) was a medieval state in Europe. It was from the late 9th to the mid 13th century. It broke apart under the Mongol invasion of 1237–1240. The state was called "land of the Rus' " . The name "Kievan Rus' " was used in the 19th century to mean the time when the center was in Kyiv. The early part of the state is sometimes known as the "Rus Khaganate". The history of Rus' proper begins in 882. This is when the capital was moved from Novgorod to Kyiv. This was after Varangians (Vikings), who were called Rus, freed this slavic city from the Khazars' tribute. The state reached its most powerful in the mid 11th century. Its lands went south to the Black Sea, east to the Volga, and west to the Kingdom of Poland and to the Grand Duchy of Lithuania. Vladimir the Great (980–1015) and his son Yaroslav I the Wise (1019–1054) ruled in the "Golden Age" of Kyiv. With the end of the Viking age, the state lost power in the late 11th and during the 12th century. The broke apart into various rival regional powers. The various East Slavic principalities were brought together in the Russian Empire in the 18th century. The modern East Slavic states of Belarus, Ukraine and Russia all get their identity from the early medieval state. ↑ (Russian) Назаренко А. В. Глава I // Древняя Русь на международных путях: Междисциплинарные очерки культурных, торговых, политических связей IX—XII вв. — М.: Языки русской культуры, 2001. — c. 42—45, 49—50. — ISBN 5-7859-0085-8. ↑ "Российский и русский". Грамота.ру (in Russian). Retrieved 16 January 2012. ↑ Tolochko, A. P. (1999). "Khimera "Kievskoy Rusi"" (in Russian). Rodina (8): 29–33. ↑ "Oleg - ruler of Novgorod". Encyclopedia Britannica. ↑ "Kievan Rus' and Mongol Periods". ↑ Plokhy, Serhii (2006). The Origins of the Slavic Nations: Premodern Identities in Russia, Ukraine, and Belarus (PDF). New York: Cambridge University Press. pp. 10–15. ISBN 978-0-521-86403-9. Retrieved 2010-04-27. This page was last changed on 14 February 2019, at 14:02.